The Triangle Shirtwaist Factory fire in New York City on March 25, 1911, was the largest industrial disaster in the history of the city of New York, causing the death of 146 garment workers who either died in the fire or jumped to their deaths. The fire led to legislation requiring improved factory safety standards and helped spur the growth of the International Ladies' Garment Workers' Union, which fought for better working conditions for sweatshop workers in that industry. 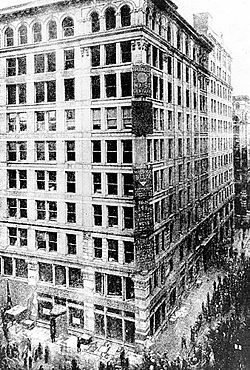 The Triangle Shirtwaist Company, owned by Max Blanck and Isaac Harris, occupied the top three floors of the ten-story Asch Building in New York City at the intersection of Greene Street and Washington Place, just east of Washington Square. The company employed approximately five hundred workers, mostly young Italian and Eastern European immigrant women, some of whom were as young as 12 or 13, who worked 14-hour shifts during a 60-hour to 72-hour workweek, sewing clothes for a wage of $1.50 per week. The Triangle Shirtwaist Company had already become well-known outside the garment industry by 1911: the massive strike by women's shirtwaist makers in 1909, known as the “Uprising of 20,000,” began with a spontaneous walkout at the Triangle Company. While the International Ladies' Garment Workers' Union negotiated a collective bargaining agreement covering most of those workers after a four-month strike, Triangle Shirtwaist refused to sign the agreement. The conditions of the factory were typical of the time. Flammable textiles were stored throughout the factory, scraps of fabric littered the floors, patterns and designs on sheets of tissue paper hung above the tables, smoking was common, illumination was provided by open gas lighting, and there were no fire extinguishers. In the afternoon of March 25, 1911, a fire began on the eighth floor. Either a lighted match or a cigarette started the fire. To this day, no one knows whether it was accidental or intentional. The workers on the tenth floor were alerted and most on those two floors were able to evacuate. However the warning about the fire did not reach the ninth floor in time. The ninth floor had only two exit doors. One stairwell was already filling with smoke and flames by the time the seamstresses realized the building was ablaze. The other door had been locked, ostensibly to prevent workers from stealing materials or taking breaks and to keep out union organizers. The single exterior fire escape, a flimsy, poorly-anchored iron structure, soon twisted and collapsed under the weight of people trying to escape. The elevator also stopped working, cutting off that means of escape, partly because the panicked workers tried to save themselves by jumping down the shaft to land on the roof of the elevator. Realizing there was no other way to avoid the flames, some of the women broke windows and jumped to the ground, nine floors below. Others pried open the elevator doors and tumbled down the elevator shaft. Few survived these falls; a single survivor was found close to drowning in water collecting in the elevator shaft. 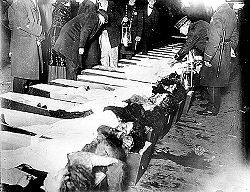 The fallen bodies and falling victims made it difficult for the fire department to reach the building. The remainder waited until smoke and fire overcame them. The fire department arrived quickly but was unable to stop the flames, as there were no ladders available that could reach beyond the sixth floor. One hundred and forty six women and children lost their lives that day. The company's owners, Max Blanck and Isaac Harris, had fled to the building's roof when the fire began and survived. They were later put on trial, at which Max Steuer, counsel for the defendants, managed to destroy the credibility of one of the survivors, Kate Alterman, by asking her to repeat her testimony a number of times—which she did, without altering a single word. Steuer argued to the jury that Alterman and probably other witnesses had memorized their statements and may even have been told what to say by the prosecutors. The defense also stressed that the prosecution had failed to prove that the owners knew the exit doors were locked at the time in question. The jury acquitted the owners. They lost a subsequent civil suit in 1913, and plaintiffs won compensation in the amount of $75 per deceased victim. 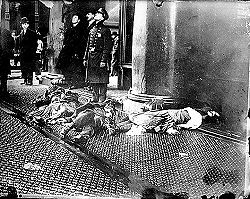 Others in the community, and in particular in the ILGWU, drew a different lesson from events: working with local Tammany Hall officials, such as Al Smith and Robert F. Wagner, and progressive reformers, such as Frances Perkins, the future secretary of labor in the Roosevelt administration, who had witnessed the fire from the street below, they pushed for comprehensive safety and workers' compensation laws. The ILGWU leadership formed bonds with those reformers and politicians that would continue for another forty years, through the New Deal and beyond. The Asch Building survived the fire and was refurbished. Real estate speculator and philanthropist Frederick Brown later bought the building and subsequently donated the structure to New York University in 1929, where it is now known as the Brown Building of Science. The building is listed as a National Historic Landmark. All links retrieved December 16, 2015. History of "Triangle Shirtwaist Factory fire"
This page was last modified on 16 December 2015, at 16:54.